(TibetanReview.net, Dec12, 2015) – After China marked the 20th anniversary of the enthronement of 26-year-old Gyaltsen Norbu as its 11th Panchen Lama on Dec 8, the exile Tibetan administration at Dharamshala, India, on Dec 10 released a book on the Panchen Lama reincarnation system, denouncing China for using the institution as a political tool. The occasion was the 26th anniversary of the conferment of the Nobel Peace Prize on the Dalai Lama, with the public function being held at the Tsuglakhang. The book, “The Panchen Lama Lineage: How Reincarnation is being Reinvented as a Political Tool”, condemns China for taking away the 11th Panchen Lama Gedhun Choekyi Nyima three days after he was recognized by Tibet’s top religious leader now living in exile, the Dalai Lama, on Apr 14, 1995, and imposing another boy on the Tibetan people in his place. Gedhun Choekyi Nyima has remained disappeared ever since, with his family. Hundreds of Tibetans and others braved cold weather to attend the function at which the Speaker of the Tibetan Parliament in exile, Mr Penpa Tsering, drew attention to the fact that the Dalai Lama had in a recent religious ceremony expressed disappointment that there were people who felt that his pursuit of the middle way policy towards China was wrong. He added that the fact that the Dalai Lama had felt driven to express such a feeling of disappointment in his speech was “a cause of unbearable concern in our hearts” and appealed to everyone to stand for the middle way goal. Both also referred to the tragic situation in Tibet in the context of Dec 10 being the World Human Rights Day. The chief guest for the function was Ms Sarveen Chaudhary, a former Himachal government minister and a current BJP MLA. 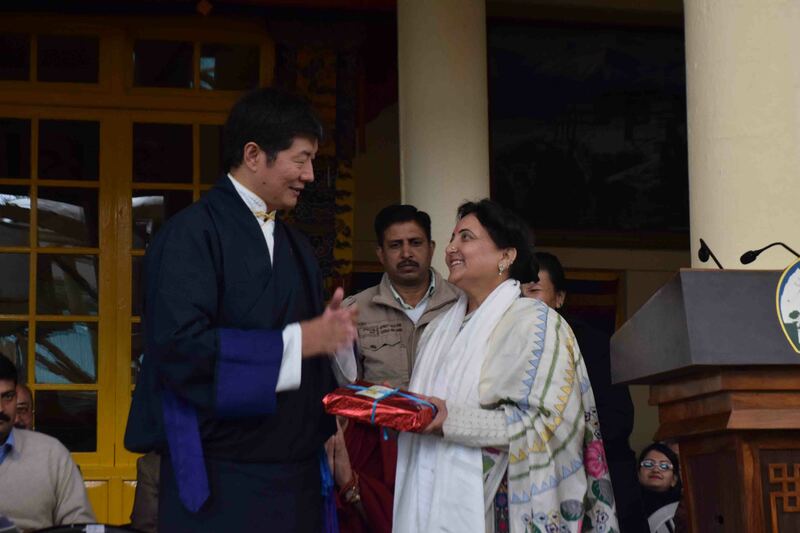 Paying glowing tribute to the Dalai Lama, she said Tibet and India shared religious, cultural and linguistic connections, and described Tibet as a sacred place for Indians as Mount Kailash and Lake Mansarovar, sacred to Hindus, was visited by Indian pilgrims every year. She also spoke about the environmental degradation on the Tibetan plateau, which she said was the major source of freshwaters in Asia. The 21st International Himalayan Festival was held over Dec 10-11, featuring traditional dances from various places in Himachal Pradesh. The festival, begun in 1995, commemorates the Dalai Lama’s Nobel Peace anniversary, is organized by the Indo-Tibetan Friendship Association. Mr Balbir Thakur, ADM of Kangra District, who was the chief guest, and Sikyong Lobsang Sangay jointly inaugurated the festival. In the Tibetan Settlement in Hunsur, Karnataka state, which the Dalai Lama was visiting to give a series of religious teachings, the spiritual leader of Tibet was offered a Kalsang Choekung (Golden Butter Lamp of Auspiciousness) by the local Tibetan residents. Those who attended the function included the state’s PWD minister Mr HC Mahadevappa, besides Hunsur MLA Mr HP Manjunath, Hollywood actor Richard Gere, the Sakya Trizin, and the Gaden Tripa. In the Indian city of Nashik, more than 250 students from prominent schools and colleges joined a rally organised by the 300 plus Tibetan residents of the local Tibetan Market area at Saharanpur Road to raise their voice for freedom of Tibet from China, reported timesofindia.indiatimes.com Dec 11. The statement also expressed deep concern on China’s endemic use of torture in Tibet and condemned China’s recent draft law on ‘counter-terrorism’ which facilitates the declaration of resistance to Chinese authorities as an act of terrorism and, in the case of Tibet, is just another expression of the broad range of suppression and human rights violations the Tibetans have to face in their own lands. Referring to the at least at least 143 self-immolation by Tibetans in Tibet since 2009. The statement deplore the Chinese government for responding with even more pervasive actions by punishing those allegedly ‘associated’ with self-immolators, including friends, families and even entire communities, instead of addressing the causes which led to these extreme acts of political protest. In London, the coalition Tibetan Uyghur & Chinese Solidarity UK (TUCS UK) held a candlelight vigil outside the Chinese Embassy while urging governments around the world and all supporters of freedom and democracy to call for an end to the persecution of human rights defenders and injustices on them in the People’s Republic of China by calling for the freedom for all and expressing solidarity with them.